A chart can quickly show you what your data represents. For example, say you have a pie chart of profits broken down by product. When one product's share takes up more than half the circle, you know it's a huge success. But maybe you'd like to know more about the data behind the chart. Who's been buying that product? When's it been selling well? Quick Base charting is interactive. This means that when you see a chart and want to know more about a particular element, you can click it to display the records that element represents. For example, when you click the piece of the pie representing that big-selling product, Quick Base displays a list of all the sales records that comprise that portion of the graphic. Immediately see the list of customers and sale prices the pie wedge represents. To view a chart, select a saved chart report from a list of reports. You can find reports listed on an app's Home page (if the app builder has included a Reports List widget), or by clicking the table in the Table bar, then clicking the REPORTS & CHARTS link. You can also create your own chart. When you display a chart in Quick Base, you'll quickly notice that this isn't your grandfather's data reporting. Quick Base charts are dynamic. You can interact with a chart to get more information about the numbers that underlie it. Run your mouse over a chart, and you'll notice that Quick Base highlights whatever portion appears beneath your cursor, and displays a quick summary of that part of the pie. When you click a part of the chart, a subset of data appears. For example, the image below contains a pie chart on the left which shows sales of musical instruments. The cursor sits over the Hecklephone pie wedge, so Quick Base shows the information for that wedge. If you want to see which customers have been buying hecklephones, all you have to do is click the wedge. 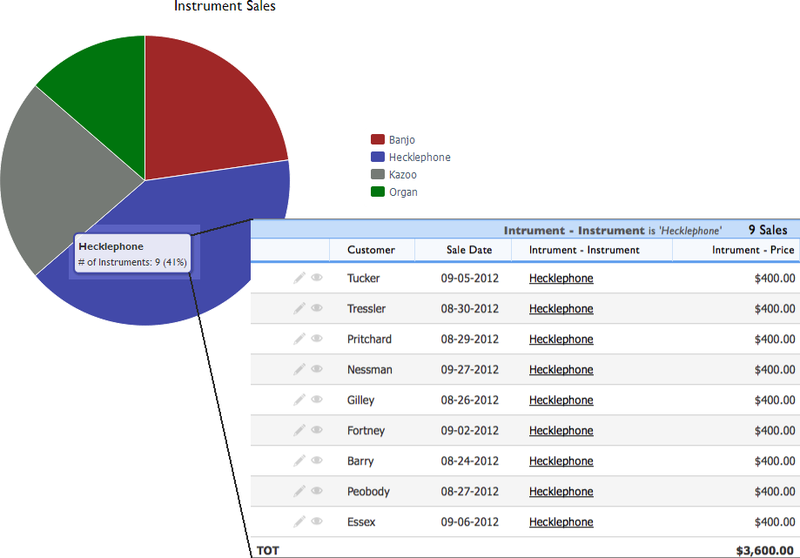 Quick Base takes you to a table report that shows all the hecklephone sales records. Click a chart element to drill down and display details. A report containing related records, like the one on the right, displays in a new screen. All types of charts work just like this. Bar charts let you click individual bars to see the many records make them tall or the few that make them short. (Read more about chart types.) If you can customize the report, you can specify which report to display when this happens. To see a table report of ALL the records used to make a chart, click the chart's title. To print a chart, click the Print link on the Page bar. When you do so, Quick Base displays a print preview screen, and the browser's print dialog. Click Print to print the report. See Print a report for more information about printing reports.